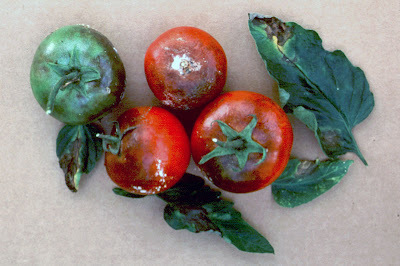 Tomato blight is a disease caused by a fungus-like organism which spreads rapidly in the foliage and fruit of tomatoes - typically in wet weather, causing them to collapse and decay. 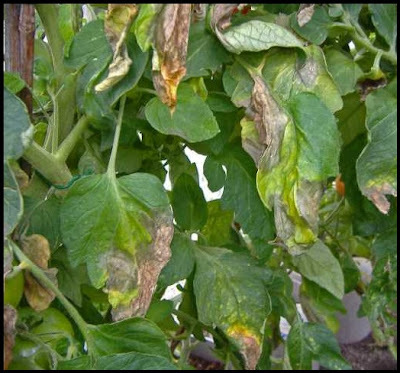 In particular, it is a serious disease outdoor tomatoes, but not as common on tomatoes grown in greenhouses. Blight is specific to tomatoes and potatoes, and some ornamental relatives of these two crops are also susceptible. Cases have been recorded on some ornamental Solanum species as well as bedding Petunias. The initial symptom of blight on tomatoes is a rapidly spreading, watery rot of leaves which soon collapse, shrivel and turn brown. During humid conditions, a fine white fungal growth may be seen around the edge of the lesions on the underside of the leaves. Brown lesions may also develop on the stems. 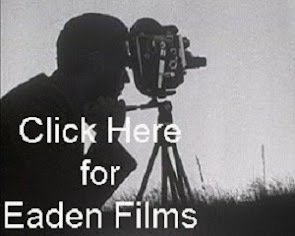 If allowed to spread unchecked, the disease will begin to attack the fruit. This is recognised by brown patches appearing on green fruit. If infected, the more mature fruits will decay rapidly. 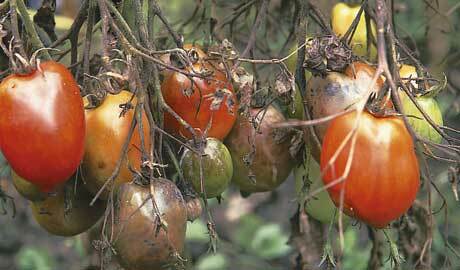 Perhaps the biggest problem with blight on tomatoes is with its cousin the humble potato. With the majority of potato varieties being highly susceptible to this virulent fungus, the late summer air is full of pathogenic spores just waiting for a suitable host plant to infect. It's Unfortunate that the closely related tomato plant more than readily fits the bill. 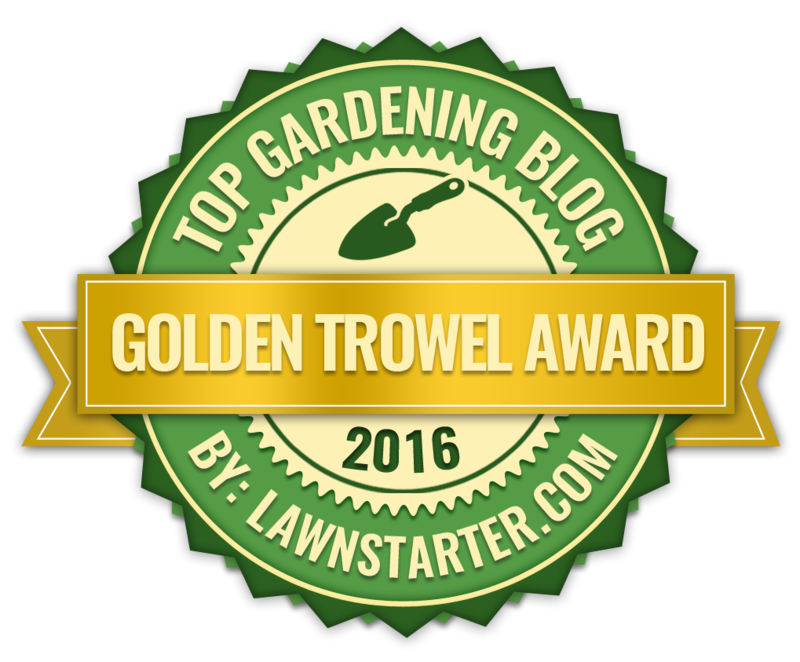 This can be a particular problem with tomatoes, especially when grown outside in the more temperate regions of the country. With the late cropping of most true outdoor varieties – and even later cropping if glasshouse varieties are grown outside – the ripening fruit will often coincide with the seasonal incidence of ‘Late Blight’. If the late summer season is particularly hot and humid, your tomato crops will probably stand little hope of survival and your years worth of work can end up as another pile being burned at the local incinerator. Because infection is so dependent on specific combinations of temperature and rainfall, periods of high risk can be predicted accurately. To find out when your tomatoes are at their greatest risk it is worth contacting your local horticultural advisory service. You will be able to access these warnings (visit the Potato Review website), but because this information is more for the commercial grower you must rely on a more restricted range of protectant fungicides containing copper (Bordeaux Mixture or Fruit and Vegetable Disease Control), as the more effective systemic products will not be approved for amateur use. As a safety net, when wet weather is forecast from June onwards, begin applications of protectant sprays as a matter of course.